New York actor Jeremy Varner (third from right) has returned to his alma mater to direct and choreograph the 2017 Homecoming Musical. Assisting him in choreography is guest artist Lily Balogh (front row, center) of the New York City Ballet. 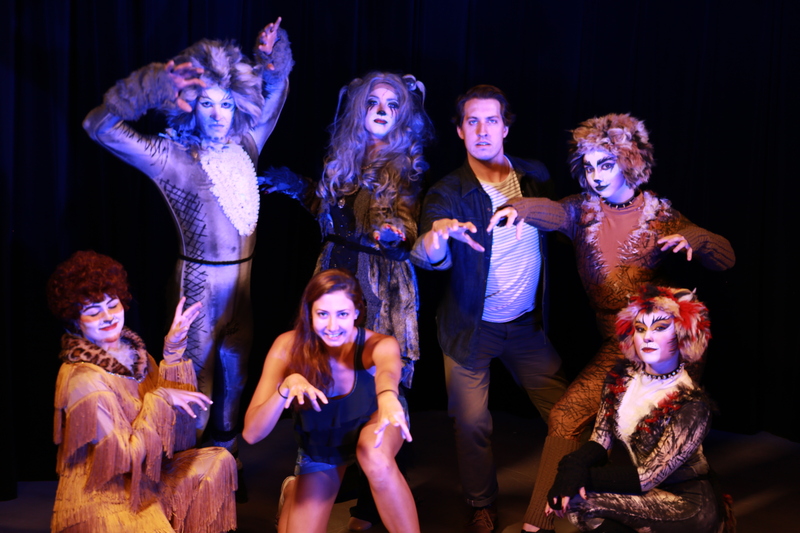 ACU Theatre is producing Andrew Lloyd Webber’s mega-hit musical Cats for Homecoming 2017 on Oct. 20-22. 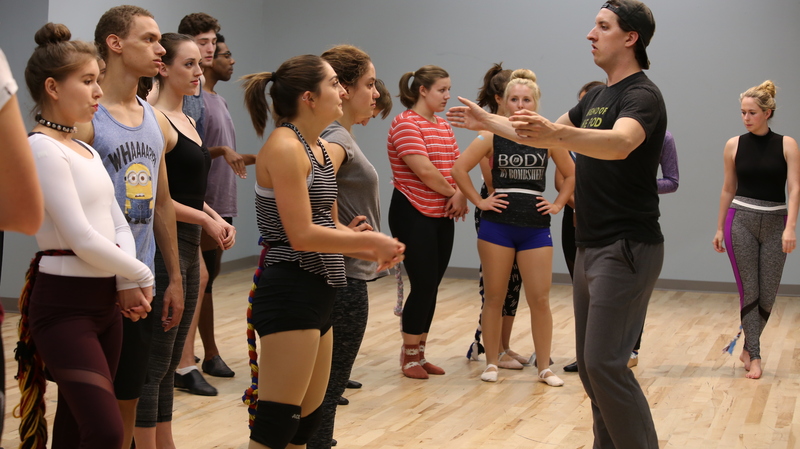 Directing and choreographing the student actors is program alumnus Jeremy Varner (’10), who performed in several Cats productions in Atlanta. 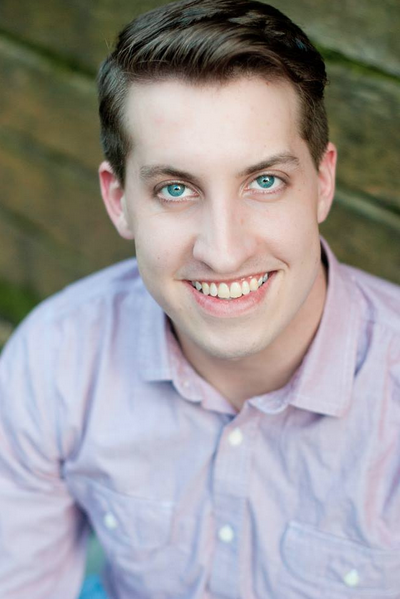 The New York actor took a break from rehearsals to talk about why the ACU and Abilene community should come enjoy a time of escapism and entertainment with Cats. The interview has been edited for length and clarity. Varner graduated from ACU in 2010. Prep for the uninitiated: Cats is a 1981 musical featuring actors dressed and acting like cats. The characters are part of a tribe of cats called Jellicles who meet one night to perform for their leader Old Deuteronomy before he decides who among them will go to the Heaviside Layer (heaven) (LEARN MORE HERE). The London production ran for 21 years, with the Broadway production running for 18. Cats seems to be a show that everyone has heard of even if they don’t really know what it’s about. How would you describe it? Cats is one of the unique musicals that has crossed boundaries. It has permeated Broadway culture into popular culture. Other musicals that have done it are like Wicked, Hamilton, Rent, Hairspray, Phantom of the Opera – musicals that aren’t contained within the Broadway community. It has a position in our cultural landscape and is famous in that respect – it’s a known quantity. The show is tricky, though, because it doesn’t fit within the traditional structure of the American musical. It’s based off of T.S. Eliot’s Old Possum’s Book of Practical Cats, which is a book of poems. When producer Cameron Mackintosh, director Trevor Nunn and Webber got permission to use Eliot’s poetry, it was under the condition that they couldn’t change anything. Webber put music to to the poems, this fantastical, quirky, weird music. And then they added dance on top of it. So, it’s not a linear narrative – it’s loose at best. Audiences, especially American consumers, were trained with shows like Oklahoma! That have a protagonist, an antagonist, a clear arc to the story. There’s a structure that works that most successful musicals follow. Then Cats comes in and smashes that. Is there extra pressure when producing Cats to get it right, so to speak? Cats is no easy feat. It’s a big show – a two-hour dance piece – which is something that ACU hasn’t done on this scale. Then you have to sing while you’re dancing. Then you’re in crazy makeup and spandex. Then layer on top of that the expectations that already come with doing the show Cats. People are coming to the show with an opinion on the show already, whether or not they’ve seen it. There is this cultural baggage that comes with the production that you have to be aware of. You have to honor those expectations while still giving the audience something unique and original. What is there to love about Cats? What I’m trying to highlight is that Cats is about something bigger than one story. It’s a piece of art. It’s not just poetry and music. It’s not just fancy theatrical production value or the dancing. It’s the combination of all of those. This is a show where truly the sum is greater than the parts. That’s why it’s so exciting: It’s a celebration of music, dance, poetry and theatricality. People who have grabbed onto Cats have grabbed onto that transcendent feeling of it – that when it truly does come together, it rises up to be something bigger than if you were just talking about its individual parts. Are the actors performing the original choreography by Gillian Lynne? We’re doing our own choreography. There are moments where I’ve given an homage to the original because it’s such a landmark within the musical theatre canon. But it’s still our production of it. So we have to honor the expectation and live up to it while still injecting our own unique experience into it. That’s tricky as well, the cultural expectation. Not every show has a made-for-TV version of it that you can grow up watching on VHS. What’s it like both directing and choreographing a musical? Directing is hard enough, and choreographing is hard enough. So doing both, my mind constantly feels split because I’m on one side, I’m looking at acting choices, continuity, flow, transitions, stage pictures. And then the other side of my brain is looking at if your foot is in the correct position, is everyone on the same count, where your paws are at in this number, does everyone leap the same, etc. I have an incredible assistant choreographer, Lily Balogh of the New York City Ballet. She’s a rock star dancer. Once I realized the asset that we had, I’ve tried to give her a few sections of the show to choreograph. There are definitely Lily’s fingerprints all over the show. It would be silly of me not to use her technical expertise and acumen. It has been a joy to have her here. With Lily, I can kind of let some of this go and let her work on cleaning the choreography so I can work more on the continuity of the show now that we have it on its feet. How are student actors taking to the show? The way the show works is that it can’t be an audience coming to see a bunch of humans playing cats. It has to be an audience coming to see cats. In order for the willful suspension of disbelief to happen, the actors have to be fully invested. Everything is responding and reacting from a truthful perspective, but not from a human playing a cat. Just from a cat. When you’re really invested in that world, you as the actor are also transported there. It’s fun. You get to pretend to be a cat for an hour and a half on stage. It’s great. The dancing is exciting and the songs are fun to sing. You’re reacting and responding with your fellow tribe members. It’s like those cheesy games you played at camp – team building. But you do it as cats. And in unitards. What has your journey been like since graduating in 2010? My career was launched when an ACU alum, Mark Smith, cast me in a show at his theatre, The Legacy Theatre, in Atlanta. I actually had a one-way ticket to New York that I canceled and had no plans to be in Atlanta. But then God had other plans and truly opened the door for me to move to Georgia. Those phrases always make me feel weird until they actually happen. And Atlanta was one of those places where everything fell into place so perfectly that it was so glaringly obvious that I was supposed to be there. That’s where I matured and blossomed as an artist, and the community there is spectacular and they were so supportive. Atlanta has a robust regional theatre scene, and I worked primarily with The Alliance Theatre at the Robert W. Woodruff Arts Center. Cats was the last show I did in Atlanta, and then that chapter closed, which was a great peace of mind to then move to New York after four years. Now that I’ve established my home and my network, I’m going to start transitioning back to the theatre side and the type of work I did in Atlanta. It’s a bigger market with more competition in it, but there are far more opportunities. 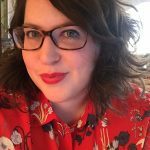 I spent two years positioning my employment, including at a church, as a coffee wholesaler and a chess teacher, that allows me that flexibility. Cats is the start of that, the launching off point. I went to school at ACU to launch my career, and here I am back at ACU to kind of launch back into that. It’s funny that that’s how it ended up. What advice do you have for the students you’re leading through this production – what do they need to know for their careers outside of ACU? A quality that seems to be undervalued is being a good person. So much of the industry is relational. If you look at it solely as a rat race and trying to get ahead and just promoting yourself, then people realize that and think that that’s your character. The phrase that I keep coming back to that I was talking to a student about, you have to figure out what your “paradigm of success” is. People are looking to be valued, whereas I think ACU helps foster students who are looking to add value. That fundamentally changes how you relate to people because then it’s no longer about you. From a Christian perspective, it shouldn’t ever be about you. You’re just a reflection of the creativity of God. If that’s how you channel and navigate all of your relationships through that lens, then people recognize that. Whether or not they recognize that it’s because of your faith, they recognize it because it’s different and it’s good. What’s your message to audience members coming to see the show? Go in expecting to enjoy yourself. Cats is escapism at its finest. Not every show is going to push the cultural and social boundaries, and not every show should. Theatre should be reflective of society as a whole, and part of it is that escapism. That’s important. So go into it expecting to enjoy it and to be transported to something completely different than your normal life. The show is a celebration of the intersection of music, dance, poetry and production value. It’s a transcendent experience. That is the beauty of it.